So…We’ve established that recession of the gums and exposed root surfaces can be quite painful, especially if something cold ‘touches’ them. We also know that this sensitivity is due to nerve endings that extend from the central nerve of the tooth. The root of the tooth is made up of a substance called dentin. The visible part of the tooth that you can see in your mouth is made up of enamel. 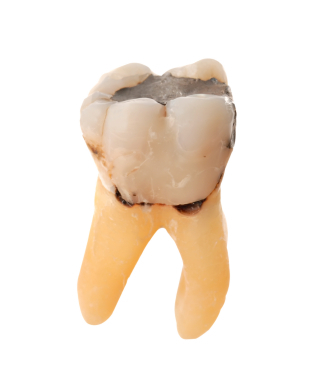 Enamel is the strongest substance in the body….even stronger than bone. The dentin on the other hand is not as strong. In fact, it is much ‘softer’ than enamel. Aside from root sensitivity, another problem that can result from recession of the gums is root decay. Remember dental plaque? It is the white fluffy ‘stuff’ that hangs around the ‘necks’ of the teeth near the gums. Dental plaque consists of multitudes of bacteria which causes red, swollen and bleeding gums and also tooth decay. 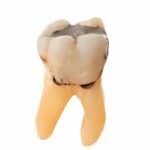 If there is plaque covering these soft root surfaces, then they decay (or rot) pretty easily and quickly. Makes sense when you think of it. Just imagine your car covered with salt in the winter….it rusts. This is a similar concept to what happens when there is plaque covering the root surface…tooth decay. Fortunately, tooth decay in both children and adults is preventable. Looking for a dentist? New to Brampton? Give us a call at (905) 791-3867 for the best in gentle dentistry.